St Olave's Church is dedicated to St. Olaf, patron saint of Norway, who attacked London in 1009 and destroyed London Bridge. 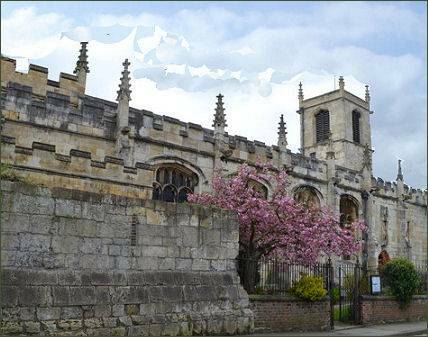 It is situated on Marygate within the walls of St Mary's Abbey beside York's Museum Gardens. The ancient historic church recalls York's Viking past, and is the oldest ecclesiastical foundation in York, with the exception of York Minster. 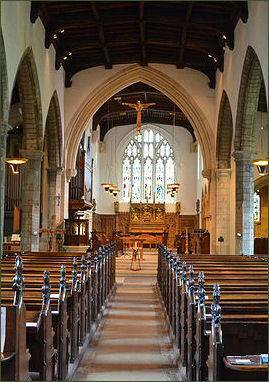 The church was founded in the late Saxon era by Siward, Earl of Northumbria. Siward, who is generally considered to be of Danish origin and was one of many Danes who arrived in England in the wake of Canute the Great's conquest of the country, although the date and context of his arrival in England are not known. Galmanho is a former name for the area where the church stands and where Siward is believed to have had his York home. Prior to the Norman Conquest the area outside York's city walls, which is now known as Museum Gardens was known as 'Earlsborough'. This is the earliest date for a church dedication to St Olaf in England. Following the Norman Conquest of 1066, the church was granted to Alan Rufus of Brittany, a companion of William the Conqueror, who built Richmond Castle. Alan of Brittany granted the church and adjoining land to Benedictine monks. Abbot Stephen and a group of monks from Whitby established the Abbey of St Mary's in 1088, Alan Rufus laid the foundation stone of the Norman church in January or February that year in a ceremony atended by bishop Odo of Bayeux, half-brother of William the Conqueror. St. Mary's grew to become one of the great monasteries of the north of England and one of the richest. In around 1089 the monks abandoned St Olave's in favour of a the abbey church in what is now York's Museum Gardens. Part of the north and west walls that formed the nave and crossing of the abbey church still stand. St. Olave's was later incorporated into a thirteenth century defensive wall that surrounded the abbey. The church was extensively rebuilt in the fifteenth century, St Mary's Abbey was disolved in 1539 during the religious reforms of King Henry VIII. In 1644, during the Civil War, the church tower was said to have been used as a gun platform in the Siege of York and the building was badly damaged. Stone from the ruins of St Mary's Abbey was used to repair and rebuild the church. The church was enlarged again early in the twentieth century. The east window retains some medieval glass. It also houses a royal coat of arms of Charles I's elder brother Prince Henry which dates to 1610-12 and a memorial to York artist, William Etty and a fine modern font cover.